The very first idea I had before the jam even started was going to be a game called “Origin Story.” It was going to be a game in which you started out as a normal person, and in the beginning, one of a number of different things could happen to you depending on your choices, each of which would give you a different set of super-powers. The game from there was basically going to be preparing to be a superhero. Things you would have to accomplish would be like finding an appropriate costume that would strike fear in your enemies hearts but also worked well with your powers (if your power is being super-flexible, you don’t want to be wearing a suit of armor for example). That was the first idea that did not get made. Just as may 5th rolled around, I largely abandoned the Origin Story idea simply because I couldn’t think of enough good ideas for what the player would try to accomplish aside from the costume selection puzzle mentioned previously. However, I still liked the idea that the player chose between different heroes who had different powers which made them have to solve the game puzzles in different ways based on their selection. This was not only an interesting game mechanic but it gives this short game replayability. You can play the game through multiple times and have a different experience. There would be four different types of superheroes you could be, a laser gun toting future soldier, a power armored hero, a genetically altered super-human, or an eternal magical being with mystical powers. 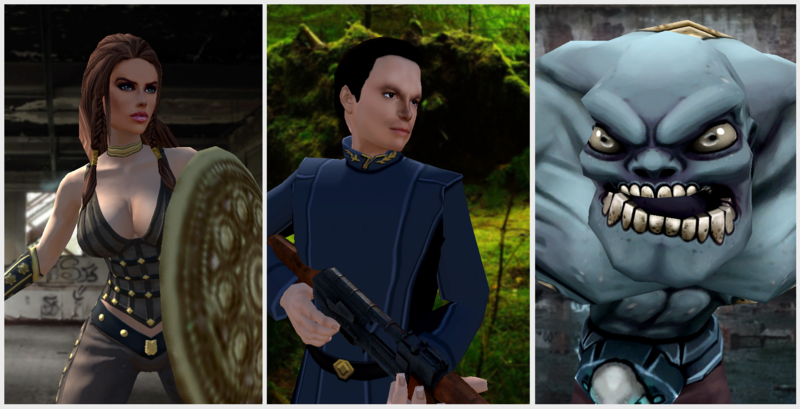 Each of these would have a nemesis that had similar powers to their own: guns, invulnerability, super reflexes, or magic. The one who kidnapped the hero’s boyfriend would always be their nemesis, but they would only be able to defeat that one last because they would need items they got from defeating the other three. The game would alternate between a platformer for the fight scenes, and an adventure game for everything else. That was pretty much my whole idea for the game in a nutshell when May 5th came upon us, and despite that not being a particularly fleshed out game design document, I went straight to work on the first scene. As I sat looking at my blank Unity scene trying to decide what an apartment should look like, it was then I decided that each scene was going to be heavily inspired by scenes from other games that I have enjoyed. 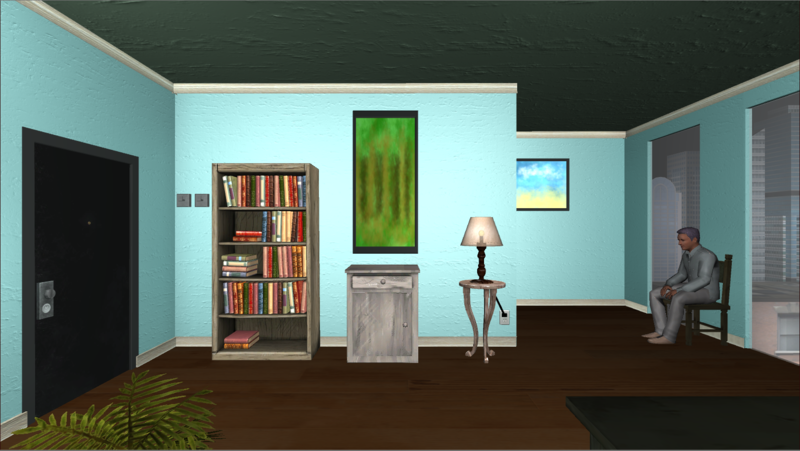 And thus this became my first scene, modeled after an apartment that appears in multiple games by Wadjet Eye Games. I knew that the first thing I needed to do straight off was to introduce the characters, set the stage and tone of the piece, and allow the player to pick which kind of hero they were going to be. Thus the game begins with a rather lengthy dialog cutscene after which the hero’s origins and name are established and the game can begin. 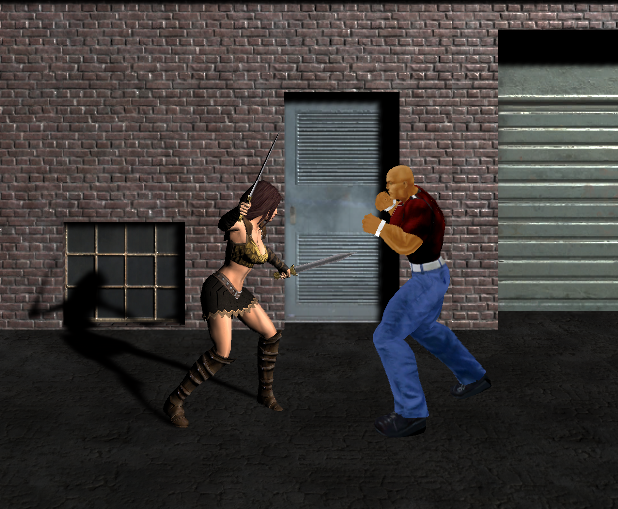 The player could choose any of the four available hero types, each of which had their backstory which they explained to Terrell, who then gets pissy, leaves, and control is turned over to the player. The next thing I needed to do, of course, was establish the fact that the game switches between platformer and adventure game, so the next scene had to be a platformer segment. Running with my idea of each scene being an homage to another game, Scene 2 is pretty clearly inspired by Double Dragon. Scene 2 is also where I ran into my first, and most significant setback. While I have designed and created many adventure games, I had never before made a platformer. I underestimated how much I didn’t know about making one. Not only did I have to make a platformer, but I also had to make this scene play nice with Adventure Creator, which I still wanted to be present for things like the pause menu, the starting and ending cutscenes and so forth but pretty much not interfere with anything during play. As you might imagine, there are two completely different versions of each hero. One version is the adventure game hero, and the other is the platformer hero. They are different prefabs with completely different components, different animators, everything besides the models are completely different. Because Adventure Creator wants to put a character in every scene it manages, each platformer scene has both characters in it, but the adventure hero is hidden behind some scenery somewhere. In this scene, she’s standing behind one of the background buildings while the platformer hero fights in the foreground. To make a long story short, making this scene function correctly was torturous and took almost the entire first week of the jam. I was WAY behind schedule and I was still planning on making ELEVEN more scenes for this game, a game which I still didn’t really have a game design for! Eventually I got three of the four heroes working in the platformer and I decided to cut the magic user hero and her purple-robed, as-yet-unnamed arch nemesis from the game. I didn’t have enough time to make that much game content, and she was the least clear in my mind about what her unique abilities actually were. I went back and removed all references to her from the first scene and she was never heard from again. The first week was nearing its end, and I had two scenes done. Granted, having these two scenes done also meant I had the framework pretty much set out for the rest of the game, but I still had a massive number of scenes left to do (9 more since I had cut the magic user) and since the first two scenes, which are just introduction really, were done, it was time to design the game. I sat down with my trusty game design tool, notepad, and designed all of the game’s conversations and puzzles in about a day and a half. I cut out the whole part about the nemesis being the kidnapper. You could find and fight the villains in any order, and it was just whoever you happened to fight last who had him. That simplified the game quite a bit since I didn’t have to plan items for the villains to drop and yet more puzzles to solve to defeat the nemesis. The design I ended up with is pretty much exactly the game that was made. At the time, I had no idea if I would be able to finish the enormous amount I had left in the one week remaining, so I had possible alternate plans in mind. Alternate Plan 1 was that the game would end after you found all the villains with something like a “to be continued screen” and you never actually fought them. This was worst case scenario if something went horribly wrong. Alternate Plan 2 was that you would defeat all the villains to end the game but all of their platformer sections would be skipped. So you would just go straight to the boss fight saving making 3 platformer sections. For a long time, I though this was what was going to end up happening. I made this, my 3rd scene, on Saturday, May 13th. I know this because I posted it on Twitter as soon as I made it for Screenshotsaturday. This reference maybe isn’t as obvious, but this bar is inspired by Lefty’s Bar in Leisure Suit Larry. Now, armed with my new actual game design document, as it were, I could make each scene in its entirety with all functionality since I had a clear idea of how it interacted with all the other scenes. I did this first with the apartment of course, then made this one. At this point, I was still working with inventory item pictures that were just the word of the items (like the money shown in the inventory dropdown was just a white square with the word “money” on it and so forth for everything else). I was only putting in interactions that were essential to completing the story line. No special text for when you did something that didn’t work. I started working on this scene on Monday, May 14th, five days before the deadline. I knew at this point that I was going to have to make at least two scenes per day to finish the entire game. That didn’t happen that day. This scene turned out to be far more complex than I had anticipated, and it was the only scene I got done that day and most of the next day. 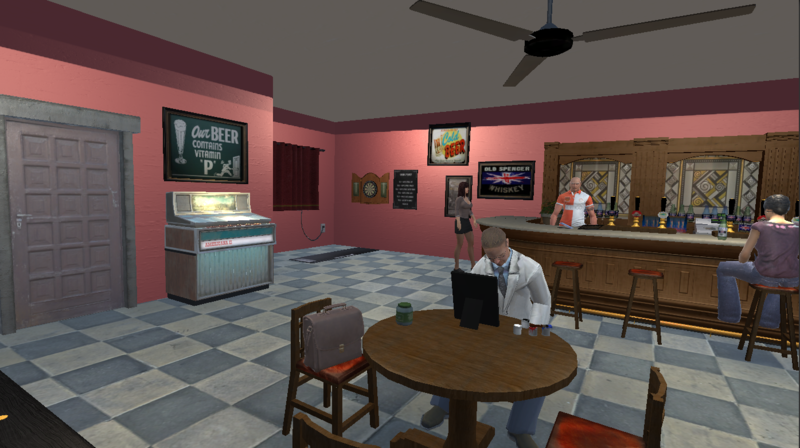 the inspiration for the interior is still coming from Lefty’s Bar in Leisure Suit Larry, but again it’s different enough that it’s not that obvious. 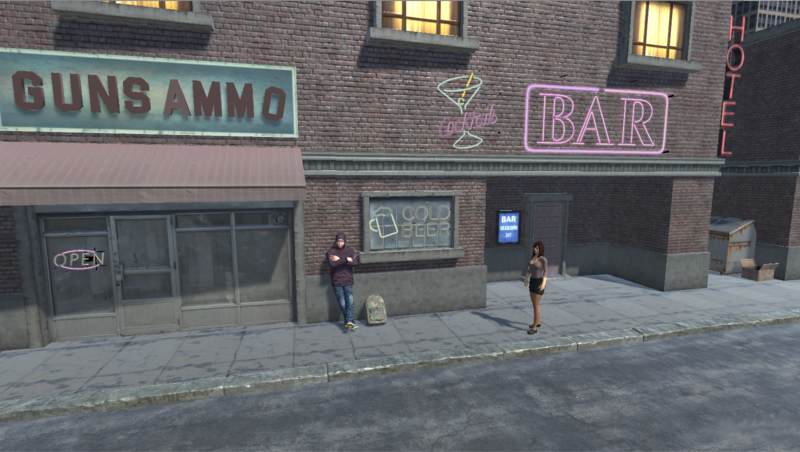 By the end of May 15th, with four days left in the jam, I finished the last scene in the city portion, the gun shop. It’s pretty simple, of course, and didn’t cause too much trouble. It was slightly inspired by the gun shops in Grand Theft Auto V.
After testing and playing through the game up to the point of finding all the villains, I had a decision. I could polish what I had, add unhandled interactions, inventory graphics, etc and risk not getting all the scenes done forcing me to use one of my alternative plans above, or push through and keep making scenes. I chose the latter and prepared for a hellish next four days of almost no sleep and constant work to complete the game on time. Keeping my alternatives in mind, my next scenes were the boss battles, in case I didn’t have time to finish the platformer portions that were supposed to lead up to them. I chose to work on them from hardest to easiest since I knew my mental state was deteriorating and would only continue to do so from stress and lack of sleep. So the first was Xi’s battle which took a very long time. I did Kooptor’s next which I didn’t expect to take as long but took far longer than I expected. Then I did Colonel Triumph’s battle which was relatively simple compared with the others. After these were completed, I created the ending of the game and tested playing all the way through with each character. I still had not done any unhandled interactions, inventory art was still placeholders, but at least at this point, there was some kind of game with a beginning, middle and resolution. It was May 18th. One more day to go. Any sane person, with an end-to-end playable game this late in the jam would have started polishing at this point and getting ready to release it. But I had 3 more scenes I needed to get in. The game was playable, but it lost a lot of its very concept without those 3 platformer sections leading up to the boss battles, and I had to get them in. With the end soon upon me, I set out at making the 3 platformer levels leading up to the boss battles. It was all planned at this point of course so the theme of each of the platformers had already been implemented in the battles. They just needed the platform sections to make that aspect of the battles make sense. First, Xi’s level, inspired by Ninja Gaiden. Next, Colonel Triumph’s level, inspired by Contra. Lastly, Kooptor’s level, inspired by Super Mario Bros.
Up until the point I started making these levels, I still had it in my head that each hero would have a special ability to help them get through the levels. The super-human could scale walls, the power-armored hero could punch certain destructible objects, and the shooter could shoot things down from high or hard to reach places. they’d each have to use their own abilities to get through. But with time so short, that was scrapped quickly. I finished Kooptor’s platformer level with 8 hours left until the cutoff time. I didn’t even have time to test the game all the way through at this point. I still had placeholder art for all my inventory! and everything you did that wasn’t right just said “you can’t do that.” 8 hours to polish this thing up into a game. With my remaining time, I made inventory pictures, and then spent most of the time until the deadline writing interaction text for anything and everything the player might reasonably try. I hate adventure games that just say “you can’t do that” all the time. Writing text for the things that don’t work is an essential part of making an adventure game and never forget it! I finally stopped writing interaction text about an hour before the cutoff, and compiled the game and uploaded. It was completely untested. Parts were tested, but I had added several whole scenes without having done an end to end test. Well, it turns out there were some horrible game-breaking bugs… but bug fixing is allowed and those bugs were fixed within the first few hours of upload. There were other bugs that were not quite as horrible discovered later and those were fixed over the next few days. And there it is for anyone who is interested. 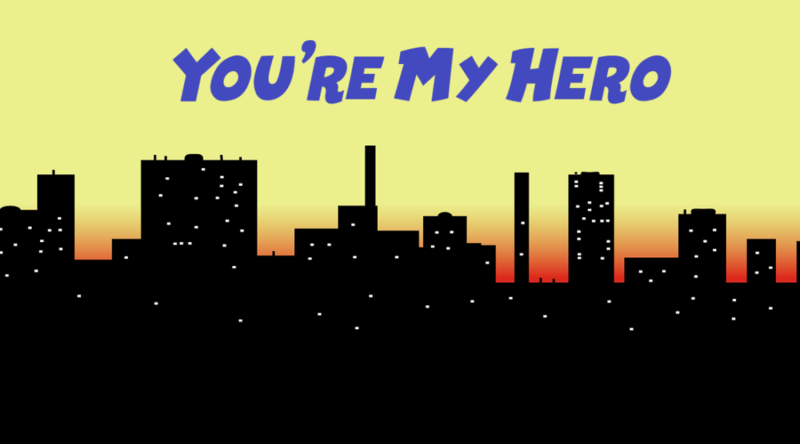 The entire story of “You’re My Hero” and Adventure Jam 2017.